EDITOR’S NOTE 10/20/2015: Another one bites the dust. My apologies. 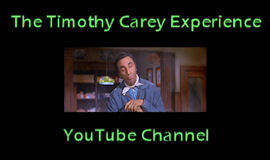 Our video this week features another of Timothy’s early film appearances, fleeting and dubbed over as it is. It’s Charles Marquis Warren‘s Hellgate (1952), starring a man Tim would encounter again on-screen, Sterling Hayden. Tim can be seen very early in the film as one of bad guy James Anderson‘s henchmen. This entertaining combination of Western and prison drama boasts an impressive cast – in addition to Hayden and Anderson, Joan Leslie, Ward Bond, and James Arness are also on board. It’s possible that Tim appears again amongst the extras in the prison scenes, but I haven’t been able to catch a glimpse of him. Perhaps you might be more successful than I – if so, please let me know! Enjoy! This entry was posted in Film, Video and tagged charles marquis warren, hellgate, james anderson, james arness, joan leslie, sterling hayden, timothy carey, ward bond. Bookmark the permalink. Pics of the Day: Animated .gifs!